Welcome to Shri Vinayak Packaging Machines Private Limited. Manufacturer & Exporter of Packaging Machines. The company was established in the year 2000. We have spread our wings to IndianSubcontinent & East Asia and we serve to Pharmaceutical, Cosmetics & FMCG sectors Bikano Foods & M. D. H. Masala are some of our prestigious clients and we are backedby excellent logistic support and Specialized R& D department. 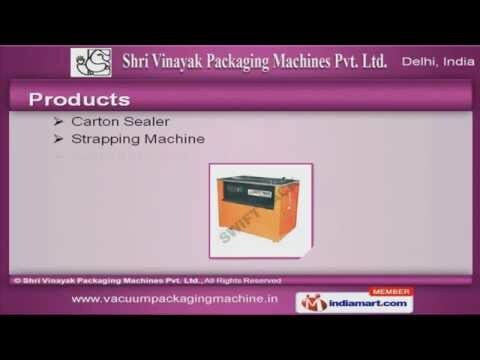 We offer a wide assortment of Carton Sealer, Strapping & Sealing Machines. Stretch Wrapping, Shrink & Vacuum Packaging Machine are also offered by us. Our Batch Coder, Conveyor System & Material Handling Equipments are a class apart. We offer L- Sealer, Filling Machine, Meal Tray Sealers that are cost effective. Electro Magnetic Induction Capper & Liquid Packing Machines are well known for theirimpeccable performance. Along with that we offer Cling Film Wrapping Sealer & Cap Closing Machines that arewidely acclaimed in the market.